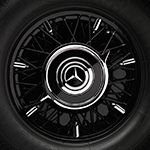 The extremely rare Mercedes-Benz Autobahn-Kurier was purpose built to suit the newly constructed Autobahn roadway. It is believed that four of this body type were built on the 500K chassis. The Autobahn-Kurier shown here is the second of two known to be built in-house at Sindelfingen on the supercharged 540K chassis. Factory commission papers show that Professor Ignacio Barraquer took ownership of this 540K in 1938, apparently after having seen its twin at that year's Paris Motor Show. An avid auto enthusiast, he and his wife immediately took their Autobahn-Kurier on an extended driving tour from Spain through North Africa, crossing Libya into Egypt. From Alexandria, they had the car shipped back to Barcelona. After the war they continued to enjoy touring in the 540K, including a drive through Austria and Switzerland in 1951. The car was well-loved by the Barraquer family, who retained ownership until 2003 when it was purchased by an American collector, who then commissioned us to perform a complete restoration. This car was a challenging and yet routine restoration for us. While judged to be original, after disassembly we discovered that the body had been re-painted black and the interior re-upholstered, not at all surprising considering Professor Barraquer's heavy usage. The complete engine and drivetrain were all there, with the exception of some updated or replaced items consistent with road-side repairs. We were most intrigued by how the original builders used components at-hand to create this car. The coach wood work appeared to be from a 540 Cabriolet A, which was then modified as needed for the Autobahn-Kurier frame. The rear quarter windows are opened with the same appliance used to open the windshield on the Cabriolet A. Presented at the 2006 Pebble Beach Concours d'Elegance, this stunning 540K received a First in Class, the Mercedes-Benz Trophy, the Most Elegant Closed Car Award, and was a Best of Show finalist. Five years on, the Autobahn-Kurier won Best of Show at the Concours d’Elegance of America, followed by the prestigious "Best of the Best" Louis Vuitton Classic Concours Award for 2011.